Feeling shy? That's OK. Check out as a Guest (but the rewards won't count). When you register as a customer (with a password), you automatically collect 2.5% of your purchases back as a thank you. You can use these points toward any future purchases on our online store. You choose to purchase directly from us which means we get a chance to know our clients personally. Thank you for getting to know us, caring about a better world, and most of all for loving yourself. Healthy products + $10 + $10 = Totally Awesome Win! Just watch the video below to learn how to refer friends to our online store. If your friend places an order - you both get 2500 points worth $10 each. Share us with your friends and tell them what awesome products we make. If they choose to purchase from us, we'll give both of you $10 each in reward points. Friends don't let friends use crap, so we have a win-win-win proposition. When you register as a customer (with a password), you collect 2.5% of your purchases back as a thank you. Use these points toward any future purchases on our online store. Friends don't let friends use crap! Share us with a friend and we'll give you both $10 in URBeautyfull points. See below for details. URBeautyfull Reward Points is a way we've chosen to give back to you as a thank you for supporting our family business. As such, URBeautyfull Reward Points hold no cash surrender value and may only be redeemed as a discount on future purchases from our online store. 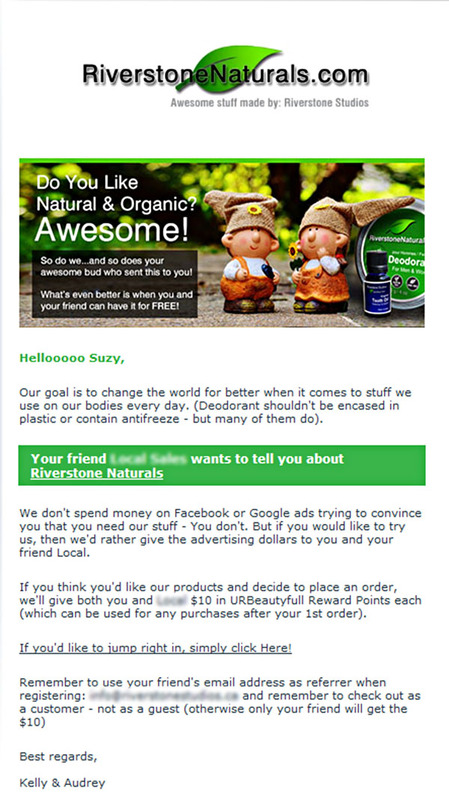 We, (Riverstone Studios), reserve the right to cancel the URBeautyfull Reward program at our discretion and without reason but will give a minimum of one month's notice to existing customers so that the opportunity there to use existing points. Customers shall be notified by email through their last given email address. Guest accounts do not qualify to collect or use URBeautyfull Reward Points. URBeautyfull is only open for customers who login and check out using password accounts. As such, referred friends only qualify for the $10 offer if their 1st order is as a registered customer - NOT as a guest. Existing registered customers do not qualify for being invited as "referred friends". URBeautyfull program is tied directly to a users email address. Changes in email addresses will nullify existing URBeautyfull accounts. If this occurs - please contact us to remedy. Wholesale customers do not qualify to collect URBeautyfull points in conjunction with their wholesale discount. We reserve the right to make any and all changes to the program without notice including changing rebate percentages or points given for referrals.